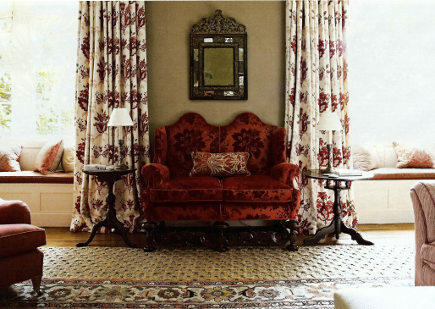 A few key custom drapery details take curtains from fine to fab. Out of habit and curiosity, I look at dozens of living room and bedroom photos each week. A majority of those rooms have curtains on the windows – some ready-made and others custom. Yet only occasionally do I see custom drapery details with a level of perfection that comes from deep understanding of how to properly dress a window. Many of these are little works of art due to their fine craftsmanship and detailing. But because they are house fittings they rarely attract the attention they deserve. Perfectly crafted curtains are slightly billowy at the bottom and break on the floor. They stack back neatly on top. Their leading edges – which face into the window – often have subtle details. Two breathtaking examples can be found in a 350-year-old manor house recently redone by London designer Guy Goodfellow, former director at Sybil Colefax & John Fowler. It’s a large house, originally dating from 1650, according to the House & Garden feature. It now combines old and new. 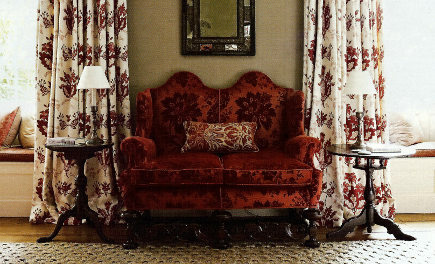 In the expansive library [top], draperies were made in a cabernet floral-print on natural linen (from B.Berger). Their luxurious fullness (2-1/2 to 3 times is the bespoke standard) allows them to flair slightly on the bottom and rest gently on the floor. Hems remain full — not pressed. The fine point here is the fullness in addition to the extra few inches in length – I think of this as the “ballgown” effect – which is quite distinct from straight up and down draperies that hover above the floor. 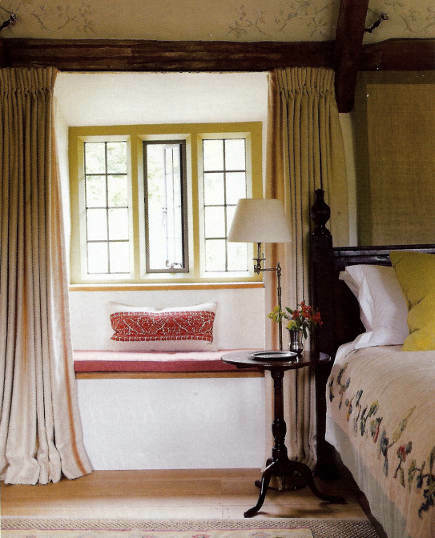 A bedroom in the same house has equally gorgeous curtains tucked directly under the ceiling beam to help frame the rather low, small window. These, made with Colefax and Fowler’s Skomer linen have a subtle red strip on the leading edge to call attention to the red detailing in the little window seat. For me, the allure of the custom drapery details is the tight pleating and weighty simplicity that give these rooms a real sense of luxury. Beautiful curtains tend to cost a bomb too Jane – I know, I used to make them! I still lament that I’m one of the dying breed who know how to make a lambrequin. Curtains like this are virtually tailored, with a lining and interlining, all attached by hand at intervals of about 12″, and hand finished. The interlining gives the sumptuous folds, the hand-pleated headings and weighted hand-finished hems give a perfect fit. They are quite an investment but should last many years so they are better in traditional settings – they have a significant insulating factor too which suits older houses. Yes, I bet they do cost the earth, Tricia. How right you are! But I just cannot get over how gorgeous they are. And how exciting that you know how to do this — one of the rare breed indeed. I would gladly host a post on “how to make a lambrequin” should you ever care to indulge yourself. I suppose, if they aren’t silk, fine curtains will last years and years. I had mine for the bedroom and living room made by an excellent workroom nearby. Of course, not English quality but good enough for me. They are a super sturdy cotton twill (perfect for the country) and always make me so happy. And now, going on 6 or so, they are in excellent shape. But in England they really know how to do these things! !